If there appears to be any odd spots on the card, this is most likely the case. 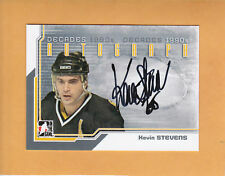 Player: Kevin Stevens. Set: 1992-93 Pinnacle French. Item#: 288. Year: 1992. Odd-sized, thicker and graded cards may be more expensive. If the title & the picture do not match. If the card is serial numbered, it may no longer match the one pictured, as we have literally millions of cards. NRMT (Shown on the first photo attached). I am the original owner of this card. 1992 Panini Stickers # 281 Kevin Stevens. WE ARE ALWAYS PURCHASING CARDS, SINGLES, COMPLETE COLLECTIONS. YOU'LL RECEIVE EXACT CARD ABOVE WHEN YOU WIN!